It was my daughter Liz’ idea for me to go to my first cooking class. She found the Fig School in Hamden, CT, and encouraged me to sign up for a class. I think she thought it would help with my grief at the recent passing of my wife Marilyn. It was a good idea, and it did, while also opening me to a passion that I had been telling myself I had for some time, but I hadn’t been listening. I chose the class called “Beyond the Sea” featuring a Timbale of Smoked Salmon with Trout Mousse and Sweet Cucumber Salad as a starter, Asian Seared Tuna with Avocado-Mango Salsa as the main, and Roasted Fruits with Pistachio and Vanilla Ice Creams as a dessert. It was an awesome meal. I liked the combination of influences: the starter kind of Eastern European, the mains an Asian/Latin fusion, with an American dessert. It all came together in a set of delicious contrasts. 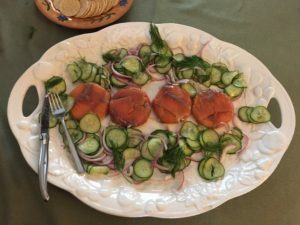 The instructor/chef Heidi Lang was warm, funny, knowledgeable and able to juggle the challenge of teaching a class and getting the meal done within the three-hour envelope of the class…while making sure everyone was involved in the food prep and having a good time. She aced it. The class was six couples and me. I did not feel at all like the odd man out. Had a great time with a great group of people. I would recommend Heidi and the Fig School highly. My first class was in June. I went back for a second class in August, and have signed up for another in November. So that’s what I did. I jumped in on the prep of every dish, working alongside Heidi, watching her and smelling and tasting the food. I bought all the ingredients the next day and reprised all of the dishes, while all the knowledge that I had picked up at the class, conscious and tacit, was still fresh. 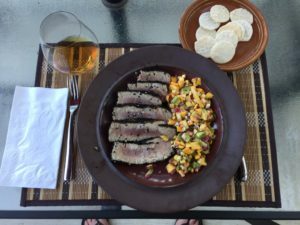 I tried the tuna a second time in the same week, adjusting the cooking time, and got it just right. I then started playing with ingredients for the timbale, making different versions for myself and bringing it as an elegant appetizer to two parties. I started playing with the salsa as well, using it as a side with various dishes over the summer. I feel like I’ve made these dishes my own. They seem like second nature to me. I can make them now without the recipe. The timbale came out just right, but the cucumber salad was too dark, as I didn’t use a light enough vinegar. 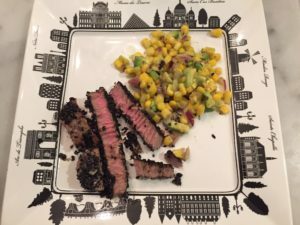 The tuna was overcooked, but the salsa was excellent, because I grilled fresh corn on the cob, shucked it and sliced off the kernels, and punched it up with some cayenne and tequila. I didn’t take a picture of the dessert at the class, but you’ll have to trust me that I nailed that. I used some fresh CT strawberries instead of mango in the salsa, as I had picked some at Lyman’s in Middlefield and wanted to use them up. Other times, I’ve used peaches. All good. Anythinng ripe is better than an unripe mango. But a ripe mango is great, if you can find one. The timbale was excellent with the shad. The color of the cucumber salad was right, as I used a “champagne” vinegar. Quite an adventure! Below are the recipes, some based on my adjustments. Blend one ounce of the salmon and all of the trout (or shad) with the butter in a food processor. Add horseradish, cream, lemon juice, salt and pepper. Blend again, but do not over mix. Lightly brush 6 ramekins with olive oil. Use the remaining salmon to line the bottom and side of 6 ramekins (you may have salmon left over depending on the size of the ramekins). 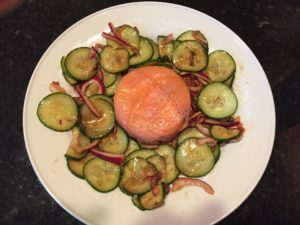 You do this by taking a slice of salmon and laying it across the ramekin, then pressing it down so that it is flat against the bottom and the sides with some of the salmon slice sticking up over the top of the ramekin on each side. Depending on the width of your salmon slices, you will need two or three per ramekin. Fill the molds with the mouse and fold the ends of the smoked salmon over the mousse. Press the salmon down gently and cover with plastic wrap and chill for at least an hour. Take the ramekins from fridge, remove the plastic wrap, invert briskly onto a plate, and remove the ramekin. Voila, Timbale! 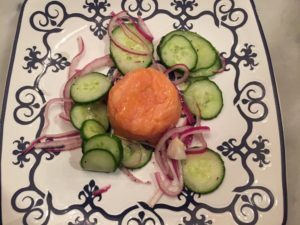 Serve with Sweet Cucumber Salad, either plated, or arranged around the timbales on a platter. Variation: use grilled sliced vegetables like zucchini or eggplant, instead of sliced, smoked salmon for the wrapper. 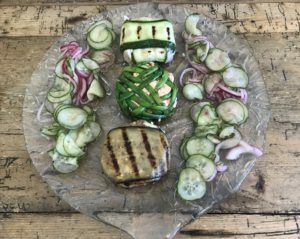 I sliced the zucchini and eggplant lengthwise on the mandoline about 1/8 inch thick, brushed them with olive oil, then grilled them using the grill side of my panini grill (grill pan or barbeque grill would work too). I cranked the panini grill up to “Sear” setting and grilled the slices until they softened a little and had nice grill marks, about a minute each side for the zucchini and about two minutes each side for the eggplant. Pay attention. Slice the cucumbers very thin, preferably with a mandoline. Add the onion. Mix the sugar, salt, pepper and vinegar together and pour over cucumber mixture. Place in a tightly covered bowl in the refrigerator for at least an hour. Serve chilled. Garnish with dill. Spread a very thin layer of wasabi paste on sides and edges of each steak. Place sesame seeds on plate. Dab tuna steaks with soy sauce and coat with sesame seeds. Heat 10-12 inch cast iron skillet for 1-2 minutes, or until hot. Add oil and spread evenly, Cook tuna on each side for 2 minutes (you are shooting for a char on the outside and very rare, almost sashimi on the inside). Slice each on the diagonal across the grain, 1/4 inch thick by 1 inch high by the width of the steak wide. Combine 2 tsp of the wasabi paste with 2-3 T of soy sauce in a ramekin for a dipping sauce. Mix well. 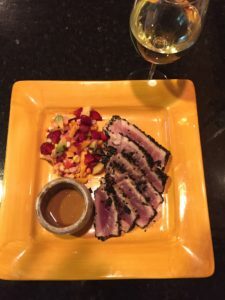 Serve the tuna immediately with the dipping sauce and the Avocado-Mango Salsa. Pour lemon and lime juice over the avocado as soon as you slice it, to keep it from browning. Grill corn in husk on a charcoal or gas grill for 2 minutes on all four sides. Allow to cool, shuck and slice kernels off the cob. Combine corn with the fruit, onion, avocado (with lemon and lime juices), tequila, cayenne and salt. Mix well and serve. Preheat oven to 350F. Roast the nuts for 5-7 minutes, just until they start to brown (slice almonds will brown much faster than the other nuts). Set aside. Increase the oven temp to 400F. Cut fruit away from the pit into halves or quarters, depending on size, and place in a 9 X12 inch baking dish. Sprinkle the bourbon over the fruit and toss well. Split the vanilla bean lengthwise with sharp knife and open up. Scape out the pulp inside the seed with the tip of a dull (table) knife. Combine the vanilla seed pulp, sugar, nutmeg and cinnamon together and sprinkle over the fruit. Mix well. Roast for about 20-25 minutes, or until fruit starts to soften. Add blueberries and roast for another 5 minutes. Set aside to cool a bit. Put a scoop of each ice cream in a bowl or on small plate. 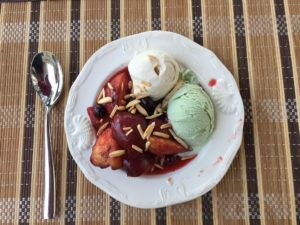 Place a portion of the fruit next to the ice cream and sprinkle the fruit and ice cream with the toasted nuts. Serve immediately. Kip, I just LOVE how you’ve taken my recipes and created you own spin! I look forward every time you come to one of my classes because you are truly interested in learning about food, it’s texture, spice blending, techniques, etc… And I love how you recreate the meal the next day so the lessons learned really stick. I am honored to have you in my kitchen, and look forward to seeing you again. You pictures are beautiful too! Kudos to you Kip!